Summer may be nearing an end, but that doesn't mean we can't celebrate the last few sizzling days with an awesome giveaway! We are also celebrating Mommy Scene's recent Green Scene Mom Award Winners, celebrating Eco-friendly product design! These sponsoring brands designed products to help kids and families beat the heat, make mealtimes easier, and stay clean, safe and cozy. 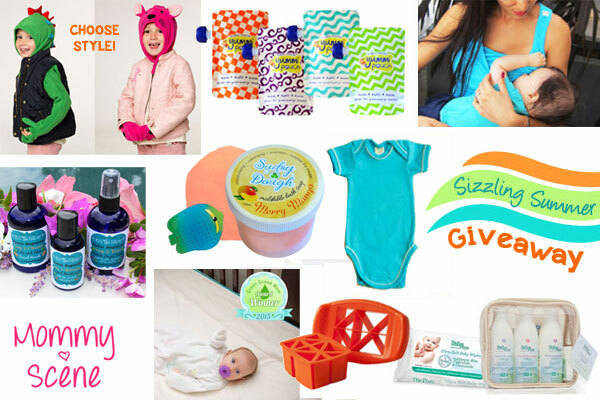 Some of Mommy Scene's favorite products are featured in this giveaway; Yummi Pouch, SweatyBaby, Sudsy Dough, It's the Balm, the Olie, Suki Moon, BabySpa, FunBites and Bun Maternity! Sizzling Summer Giveaway Prizes - Mommy Scene Prizes: Bun Maternity and nursing tank top, Short sleeve tee shirt, & Long striped tank top SweatyBaby organic performance onesie Sudsy Dough Moldable Soap with surprise toy Suki Moon Sound Sleep Crib Cushi & sheet The Olie Minkey Cat or Dino gloves, scarf and hat all in ONE! FunBites food cutter - squares, hearts or triangles! BabySpa Splish Splash gift set & biodegradable wipes It's the Balm Natural Facial Regimen Yummi Pouch Brights reusable food pouches Enter to win all of these great prizes! This contest is hosted by Mommy Scene and is open to US entries. One winner will be chosen and displayed on the giveaway widget after the contest ends on Sept. 2nd, 2015. 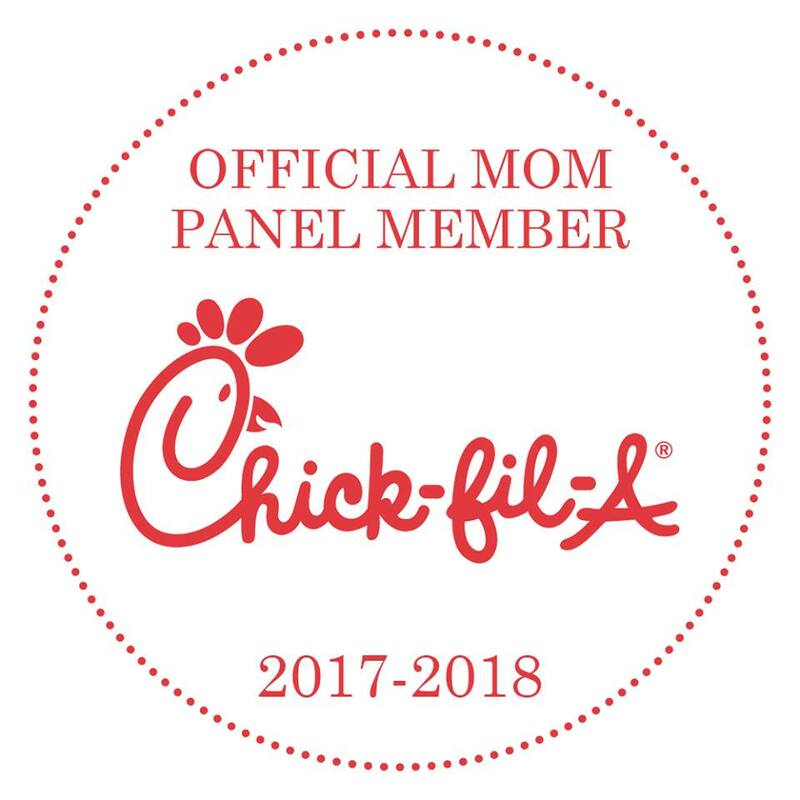 Mommy Scene and participating blogs are not responsible for sponsoring brands who do not fulfill their prize obligations. Prizes will be shipped individually directly from each brand. 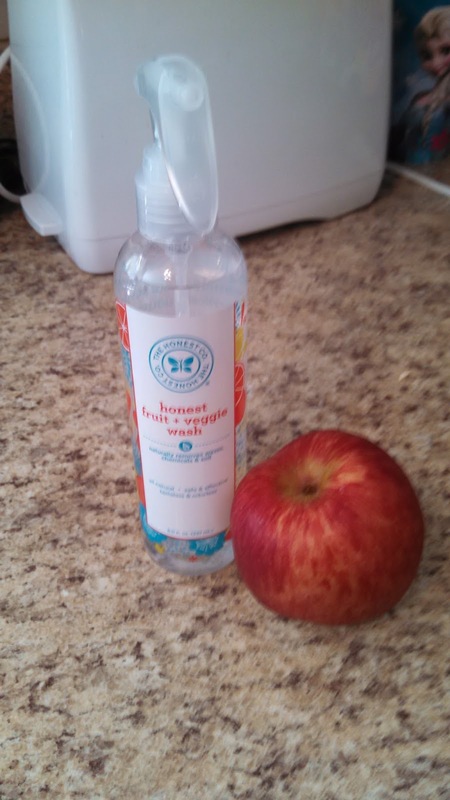 I recently purchased some products from The Honest Company (www.Honest.com) for my children. 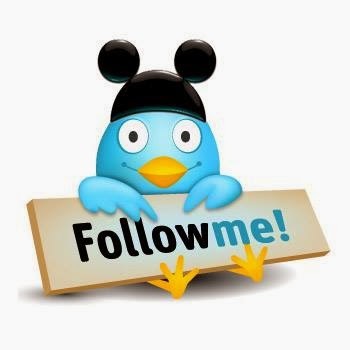 I am really enjoying everything and I wanted to share my experience with my readers. First off, I want you to know up front that I was NOT compensated for this review, this is my own opinion. 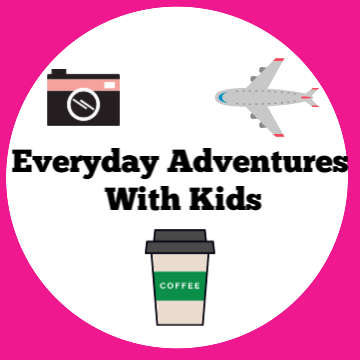 I was searching for safe products for my children and came across The Honest Company's website and started to explore the many wonderful items that they sell. I made an online purchase and when my package arrived both myself and my three children were very excited! I purchased the Honest Wet Mopping pads (separate review here) and the hand sanitizer, fruit and veggie spray, toothpaste, shampoo/body wash and the Multi Surface Cleaner. My kids sampled the hand sanitizer first and my 8 year old's immediate reaction was priceless! "Mommy it doesn't burn my boo boo when it goes on my hands!" she exclaimed! My son even loves the hand sanitizer!! He normally refuses to use any type of sanitizer because he says they 'stink'. This one doesn't leave your hands sticky or greasy feeling and best of all it is very mildly scented. It isn't overbearing like some sanitizers. I purchased the kids shampoo/body wash which is lightly scented sweet orange vanilla. My children really love this and I have noticed a difference in their hair already after just one week of use. Their hair is not oily and is much easier to brush. Love this! Happy kids equal happy Mom! The shampoo/body wash (along with all of their products) contains no harsh chemicals and is hypoallergenic, tear free and safe for babies with eczema and cradle cap. One of my favorite products that I purchased is the Multi Surface Cleaner. I am such a neat freak, I clean the kitchen table and counter tops after every single meal. Then one day I realized that the cleaner I was using contained amonia and then I thought about the fact that my kids were eating their snacks straight off the table. Ahh! I am so happy to have found this Multi Surface Cleaner that is made without amonia or any harsh chemicals! Plus it doesn't leave any type of residue behind. 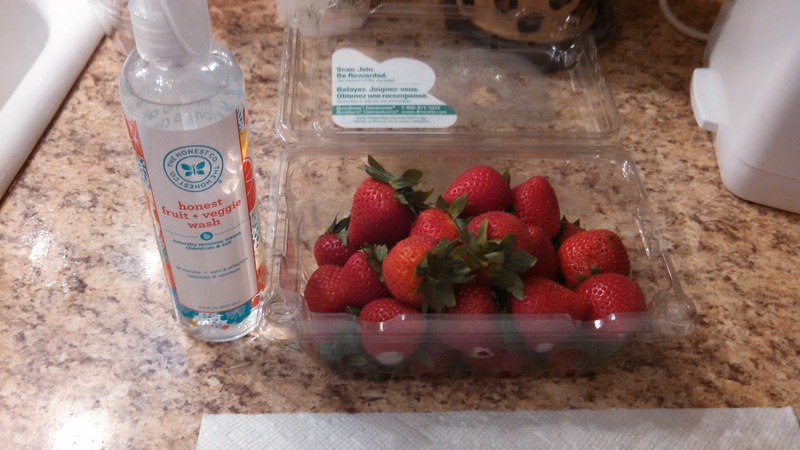 The fruit and veggie spray is great! I use this almost daily because my kids love fresh fruits. I spray it on the fruit and let it sit for about two minutes then I wash and serve. Very simple and safe. The wash is more effective than cleaning with just water. It helps the fruit last up to 200% longer too! 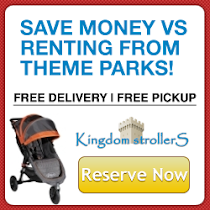 For $6.95 per bottle this is such a great item to have. Many fresh fruits contain pesticides and other harmful chemicals that water will not eliminate which is scary. Overall, I am highly satisfied with my recent purchases from The Honest Company. My kids love the tooth paste and shampoo/body wash. 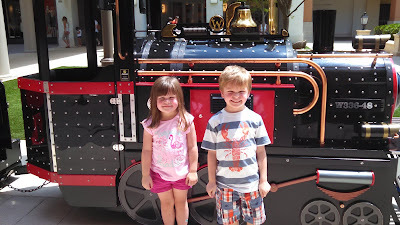 Happy kids = happy Mom! 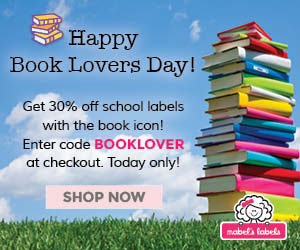 Get 30% off the Ultimate Back to School Combo with the book icon at Mabel's Labels! Last week my package arrived from The Honest Company. I am really excited to have found a company that produces non toxic products for children including household cleaning supplies. 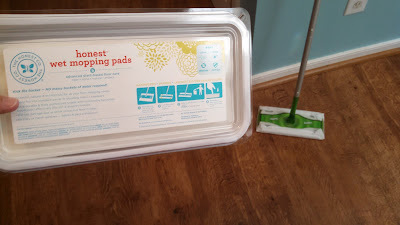 I purchased these non toxic plant based floor cleaning pads. These smell wonderful (citrus rosemary) and fit easily onto my sweeper. These really work great, they pick up so much and you can use both sides. My floor is laminate but they work on real hardwood floors and bamboo floors. 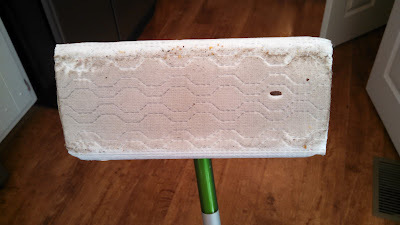 To learn more about the Honest Wet Mopping Pads you can visit their website at https://www.honest.com/cleaning/wet-mopping-pads They are $8.95 for a package. Super happy when my package of Honest.com products arrived last week! I ordered my children tooth paste, shampoo/body wash, hand sanitizer, fruit and veggie wash and multi surface cleaner. The floor was pretty dirty as you can see, this just shows how they pick up crumbs, dirt, etc. With three children crawling around on the floor I am really happy to have found a SAFE cleaning product that I can feel safe about using. My children are constantly on the floor and knowing that there are no harsh chemicals such as phosphates or amonia makes me a happy mom! 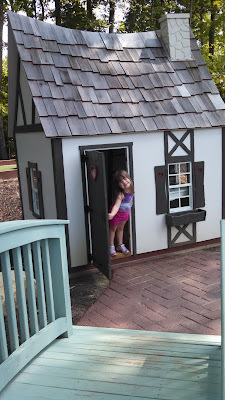 Stay tuned for a complete review of the children's products that I ordered. Summer is winding down in our house, school does not start until after Labor Day here, however I am already in the 'back to school' mode. I have been purchasing the little's back to school supplies, clothes, backpacks, shoes and even winter coats!! Yes I am a bit ahead of the game, but I just love when the air turns cold and it is fall. Counting down!! My kids on the other hand wish that summer would last forever. 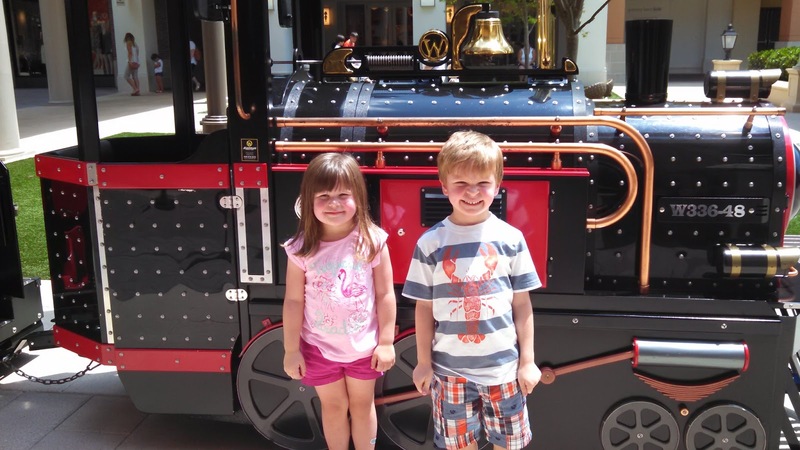 They are having quite the summer, daily fun and adventures. 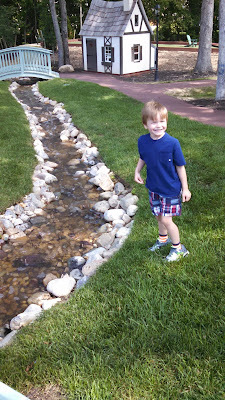 Oh, to be a kid again! 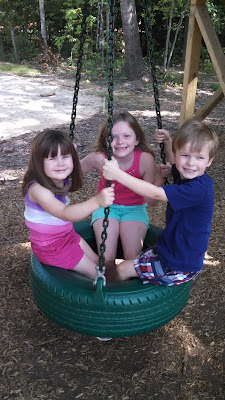 Playing at an awesome playground is always a fun time! 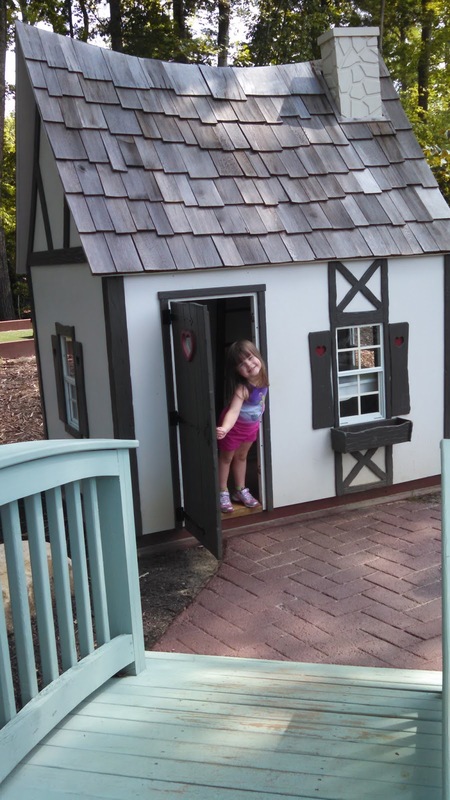 Here is a great activity for children of all ages. Create a super easy and fun summer scavenger hunt. You can do this inside or outside. It will take about ten minutes for you to put together. Easy peasy. 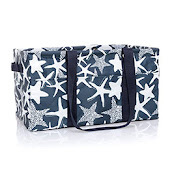 Just collect about 10-15 summer items (examples: goggles, sunscreen bottle, beach ball, etc.) Hide these items in various locations inside or outside. Then using your computer or you can even hand write a list (you could print the list out and use graphics from Clip Art) give each child a list of items to find for the scavenger hunt. If your children are older, you could give clues instead of writing the name of the actual item (example clue: this keeps you safe from the sun). Just have fun with it.